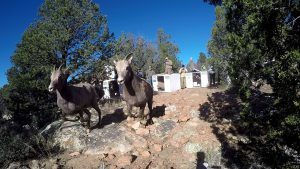 PAYSON, Ariz. – Arizona Game and Fish Department biologists report that the Rocky Mountain bighorn sheep that were relocated last November from Eagle Creek near Morenci to East Clear Creek/Leonard Canyon north of Payson are doing well. Fifteen of the 30 bighorn sheep released were equipped with GPS radio collars so the department could monitor their movements and habitat use. The bighorn sheep have been exploring their new home, with the majority staying close to the release site near the confluence of East Clear Creek and Leonard Canyon. 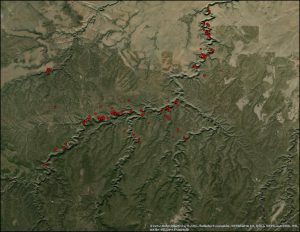 GPS radio collars donated by the Midwest Chapter of the Wild Sheep Foundation allow AZGFD to monitor movement of the bighorn sheep.